Khokhloma, Hohloma or Khokhloma painting (хохлома or хохломская роспись in Russian, or Khokhlomskaya rospis', Russian pronunciation: [xəxlɐˈma]) is the name of a Russian wood painting handicraft style and national ornament, known for its curved and vivid, mostly flower, berry and leaf patterns. Often the Slavic mythical figure of Russian fairytales Firebird is also a part of Khokhloma painting. When painted on wood, in most cases red, black, green, yellow and orange are used over a gold background. The effect it has when applied to wooden tableware or furniture, making it look heavier and metal-like. The Khokhloma painting symbolizes the high importance of forests and nature in Russian culture and its history. Russia comprises the world's largest forest area. Khokhloma first appeared in the second half of the 17th century in what is today known as the Koverninsky District of the Nizhny Novgorod Oblast, Volga region. The handicraft was named Khokhloma after a trade settlement in the same oblast, where craftsmen had been known for making and selling their handmade goods between the 18th and early 20th centuries. The making of khokhloma was first mentioned in 1659 in the letter of a boyar called Morozov to his bailiff, containing an order for the following: "One hundred painted dishes polished with powdered tin, both large and medium, of the very same kind possessed by us earlier, not forgetting twenty large painted wine bowls, twenty medium, and twenty somewhat smaller". The handicraft owes its origin to the Old Believers, who, fleeing from persecutions of officials, took refuge in local woods. Even earlier, however, local villagers had experience in making tableware from soft woods. Among the schismatics there were icon-painters, who taught local craftsmen this painting technique. Ivan Bakanov. Khokhloma artists at work. Palekh miniature, 1929. An original technique of painting wood in a goldish color without applying real gold is typical of Khokhloma, a remarkable and ingenious invention of Russian craftsmen. Articles carved out of wood (tableware, mostly) were usually primed with clay mortar, raw linseed oil, and tin powder (nowadays aluminum is used). A floral pattern was then painted on top of this coating with a brush. After that, the articles were coated with linseed oil (nowadays, synthetic oil) and hardened in a kiln at high temperatures. 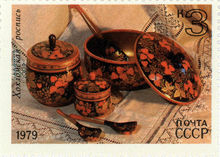 A combination of red, black, and gold are typical colors for Khokhloma. There are two principal wood painting techniques used in the Khokhloma, such as the so-called "superficial technique" (red and black colors over the goldish one) and the "background technique" (a goldish silhouette-like design over the colored background). In its early days Khokhloma became known in the Orient and the art of wood were produced for Indian, Persian and Central Asian markets. Through an exhibition in Paris the Khokhloma art became known at the end of the 20th century in Central Europe, Egypt and the United States, as a result of which many orders for Khokhloma production came also from these regions. The Khokhloma handcraft seemed to be fading away in the early 20th century, but it revitalized during the Soviet times. The Khokhloma craftsmen united into artels in the 1920s - early 1930s. In the 1960s, the Soviets built a factory called the Khokhloma Painter near the Khokhloma village and an industrial association called the Khokhloma Painting in a town of Semyonov. These two factories have become the Khokhloma centers of Russia and produce tableware, utensils (mostly spoons), furniture, souvenirs etc. Unique works of Khokhloma art can be seen in a Khokhloma Museum that was opened in the factory of Semyonov in 1972. Among them there is a huge Khokhloma spoon 2 meters and 67 cm large and a bowl one and a half meter large. ^ Jemeljanowa, Tatjana (2001). Das GoldeneChochloma - Dekorative Holzmalerei. Germany: Interbook Business. p. 14. ISBN 9785891640931. Wikimedia Commons has media related to Khokhloma.